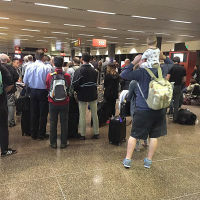 People queuing at Seattle Tacoma International Airport in the USA after an IT glitch hit British Airways check-in systems. British Airways is apologising to passengers for delays after an IT glitch hit check-in systems. Travellers spent hours queuing in airports across Europe and the US, with some passengers also experiencing problems with online check-in. Service will continue to be "slow"
The airline says check-in systems at Heathrow and Gatwick are now back to normal. Responding to passengers on Twitter in the early hours of Tuesday morning, the airline wrote: "We apologise to our customers for the delay and we appreciate their patience as our IT teams work to resolve this issue." A BA spokeswoman later said the airline was "checking in normally across all of our airports", adding the process at Heathrow and Gatwick is "a bit slower than usual". Matthew Walker, a passenger hoping to fly from the US to London, said he was waiting for more than two hours to board his flight at Seattle Airport. The 29-year-old financial analyst, originally from Australia but living in London, checked in online before arriving to catch his flight but says staff on the ground could not access their computer systems to see which passengers had gone through security. Speaking from the airport, he told the Press Association: "People were lining up, some had already checked in and got through security, but others, when this thing happened, whatever it is, were stuck in the check-in queue. "So they (the staff) have the problem that they didn't know who had already gone through the gate because all the systems literally just had a meltdown, basically." In July BA also had to apologise for causing delays after a glitch in its new check-in system. The airline began installing the system at airports across the world in October last year and the rollout was completed earlier this year. On the latest issues, BA said in a statement: "We are checking in customers at Heathrow and Gatwick Airport this morning as normal, although it may take longer than usual. "We would encourage customers to check in online before they reach the airport." Holidaymakers can take out travel insurance to make it easier to claim for delayed or cancelled flights.